MyMemories Blog: Meet this week's Featured Designer! It's Darlene Haughin Designs! Meet this week's Featured Designer! It's Darlene Haughin Designs! Hello! I’m Darlene Haughin, aka Darlene Designs. I’m a married mom of four terrific sons (and one gigantic yellow Labrador Retriever). Although I now live in the central California valley, I’m a native San Francisco Bay Area gal. I have been designing since 2007. When I’m not getting creative on the computer, I work as an administrator for a telecommunications consulting company. I’m active in my church and enjoy volunteer work, both at church and in the breast cancer community. My family (and friends who I consider family) is my life and I love spending time with them. I also enjoy traveling and have been blessed to be able to visit some amazing countries. 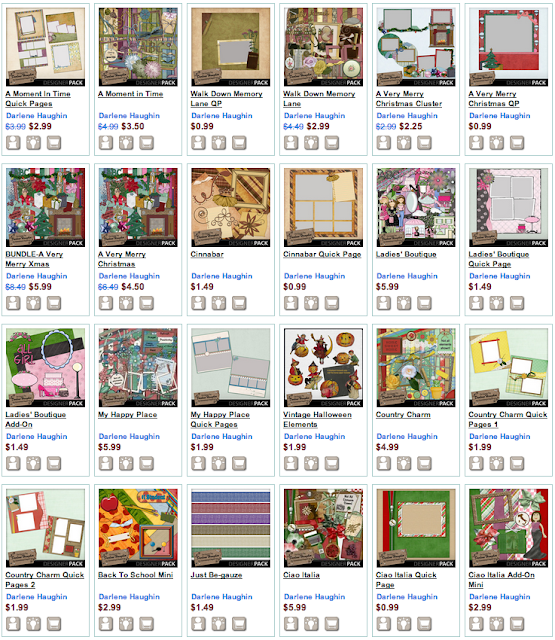 So take a peek at her shop and comment and tell her YOUR favorite! She's offering a $50.00 shopping spree in her shop for One Lucky Duck!!! So enter today! Winner posted next Monday! I love the colors of A Moment in Time. They remind me of my mom. Everyday Matters is super cute! I like your Happy Camper, as I like to camp, and Sleepy Time as the colors are somewhat different from most kits for children's 'sleepy' kits! I really like your "Music Warms The Heart" kit! I have lots of photos with this theme to scrap. Love all the time elements in your "Time Stands Still" kit :) Thanks for the chance! I love the colors in the Honeysuckle kit. I am just getting started, and it is quite overwhelming, but so much fun! Love the color combo of One Winter Night. Thanks for the chance! All your quick pages are good, but I especially like the A Moment in Time quick pages, particularly the top one on the right and the lower one on the left. So many quick pages only have room for one or two pictures and I take so many pictures that I usually end up with several pictures on each page.